It seems like a lot of hard-money-hawks were caught off guard by last month’s dovish shift by Powell. I have had more than a couple of conversations with different market participants who have expressed disbelief about how quickly Powell abandoned his tough “we-won’t-let-market-conditions-influence-our-monetary-decisions” policy. These Powell-disciples are rightfully feeling a little betrayed. After all, Powell promised he would tune the economy to the real economy, not the financial economy. For these new-era hawks, the problem of the last decade has been a FOMC board that has caved to every hiccup in the stock market. They have argued that in the long run, these policies create an economic environment filled with excesses and mis-allocated resources which ultimately leads to less growth. They were excited to finally have a non-academic business-person in the FOMC Chair that recognized this reality. I understand their point of view. And although I am not smart enough to judge correct policy, I have been around the block enough to know the chances of their policies being enacted is about high as Salma Hayek phoning me up to go out for coffee. It was easy for Powell to mouth words about not being beholden to each market tick when the stock market was shooting higher. It didn’t take much courage to stress the long-term-soundness of money when financial conditions were easing. But really, why was Powell so intent on establishing such a hawkish tone? You might disagree with the Fed targeting 2% inflation. Yeah, I get it. it is arbitrary and could very well be improper policy. But here is my advice. Instead of spending your money fighting the market hoping for the Federal Reserve to realize that 0% is a better target, take that money and run for office so that you can change policy. As I repeat time and time again, trade the market in front of you, not the one you want. 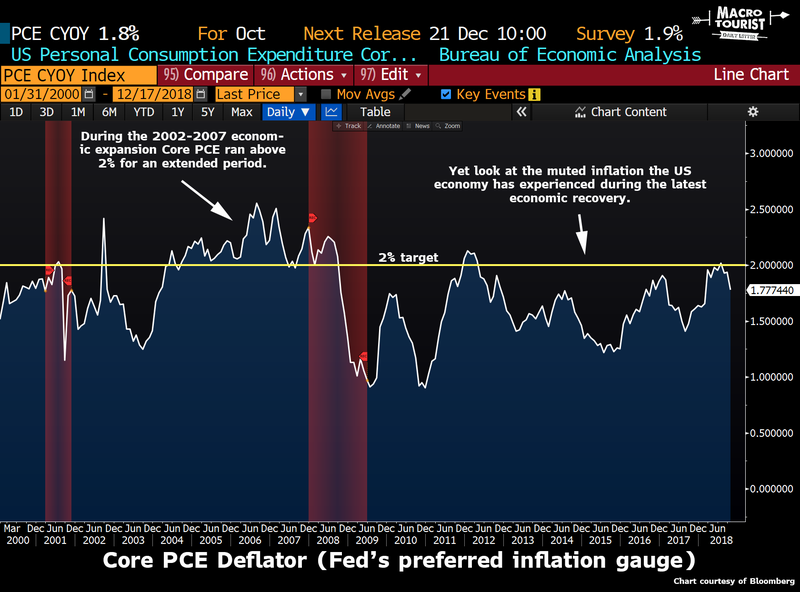 Like it or not, the Federal Reserve has a 2% inflation target and the reality of the current economic cycle is that there have only been five months when inflation has ticked above their target. If we accept that the Fed’s 2% target is a not a ceiling but a long-term average that the Fed is aiming for, then it makes Powell’s hawkish stance all the more peculiar. Here’s my take. When Powell took office, financial markets were rocketing higher due to Trump’s pro-growth tax cuts. Financial conditions were easy and it looked like another bubble was forming. So Powell took the opportunity to lean against the froth and adopt a hawkish bias. Ironically, this caused financial conditions in the United States to ease even further as capital stormed in. In the current environment where most Central Banks are actively engaging in financial repression, Powell represented a welcome change. Capital goes where it is treated best, and for most of 2018 that was the United States.